Most of us have already tried making a SWOT analysis, from the academic projects and assignments that require one up to the tasks that are given to us as working professionals. There are different kinds of SWOT analyses like business SWOT analysis, marketing SWOT analysis, and competitor SWOT analysis. One of the main factors that affect the effectiveness of a SWOT analysis is your ability to come up with a properly defined and specific discussion. Make a more thorough and well-defined SWOT analysis with the help of visual aides like SWOT analysis charts. 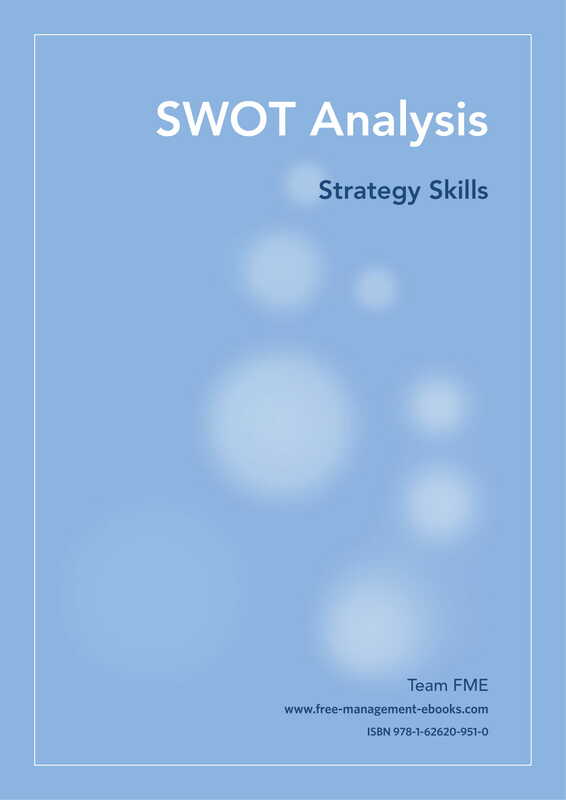 Try to develop your own SWOT analysis with the help of our SWOT analysis chart examples. These references will allow you to format your SWOT analysis accordingly and ensure that the information that you will put together are properly presented. Have you ever tried to create a healthcare SWOT analysis or any other kinds of SWOT analysis for this matter where you have no guides to look at? Working with no direction and references can actually lengthen the time of the entire process and may also cause you to come up with an underwhelming SWOT analysis. Hence, it is highly suggested for you to use charts and other guides that can make it easier for you to plot all the information that you want to include in a SWOT analysis document. A SWOT analysis chart can provide a presentation of a clearer matrix when compared to using outlines and drafts. 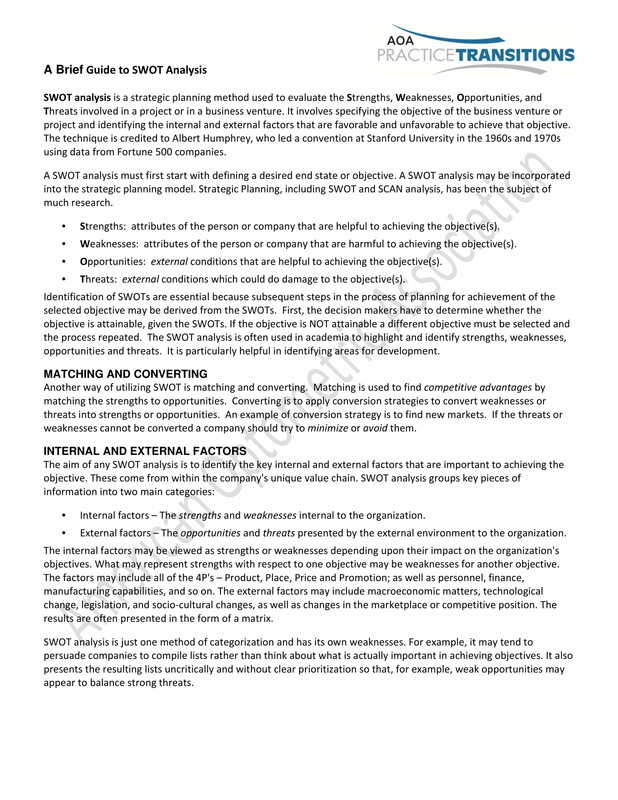 This can help you have a better reference if you want to implement strategies, tactics, and planning techniques within the different phases of your SWOT analysis. 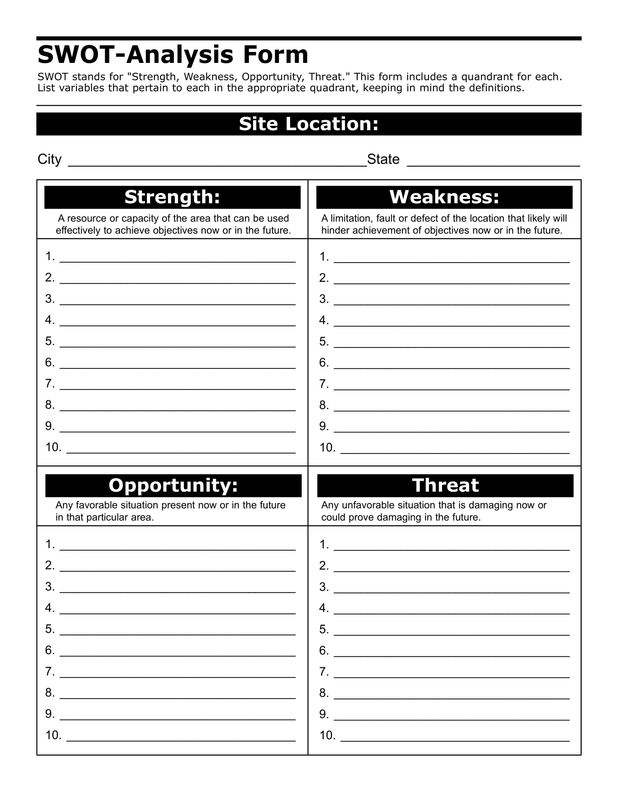 A SWOT analysis chart can make it easier for your audience to identify the listing of your strengths and weaknesses. This chart can also help them become aware of the threats that are present in the outside environment as well as the opportunities that your business can benefit from once grabbed and incorporated in your operations. A SWOT analysis chart can make the browsing experience of the analysis more ideal especially if it will be used for business planning and development processes. 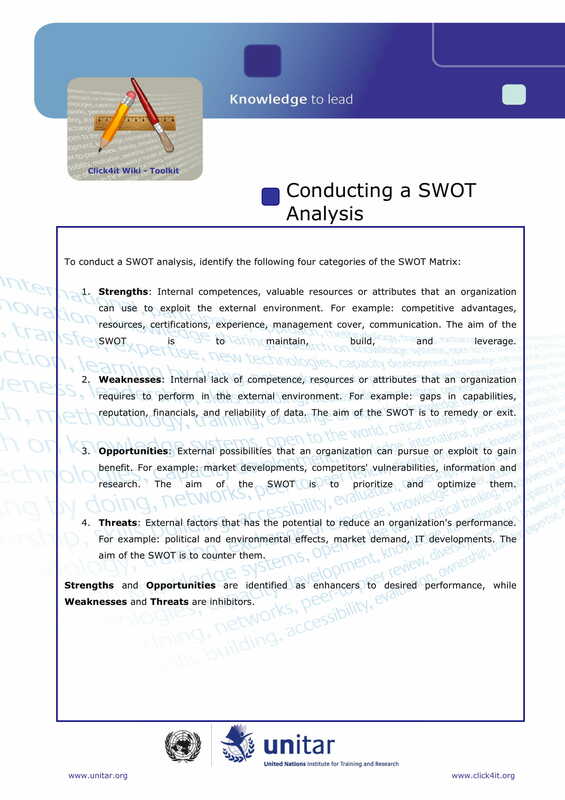 Aside from providing an in-depth presentation of the condition of the business and its actual operations, the SWOT analysis chart can also give utmost focus in the description of external factors like the presence of competition and the shifts in market trends that can affect the efficiency of the plans of action of the business. A SWOT analysis chart can make it easier for all the stakeholders of the business to be aware of what the document’s purpose and objective is. Since you can directly and clearly present the elements and factors that you have considered with the help of the chart, there will be a more transparent and specific discussion of the ventures and/or project plans of the business and how your analysis reports can affect the implementation of key action plans. A SWOT analysis chart can efficiently provide details for consideration if you want to know both the favorable and unfavorable factors present within the business environment. When making a business plan or a project plan, being able to see these information within a chart can help you create relevant and necessary objectives that can greatly impact the success potential of your undertaking. Making a marketing SWOT analysis, business SWOT analysis, or any SWOT analysis chart requires your full effort and attention so that the details that will be in these document can be as accurate and as updated as possible. Ensure that you will create metrics that can help you measure the quality of the SWOT analysis chart that you want to have for your organization. Aside from this, you have to gather relevant information that you can place in the layout that you came up with through the help of chart templates. Listed below are the characteristics of an effective SWOT analysis chart. Make sure that your SWOT analysis chart can provide or generate information that are relevant, meaningful, and necessary. It is important for you to ensure that all the categories or segments present in the chart can be used in attaining the desired outcomes of the organization who will use it. A SWOT analysis chart can be fully utilized if it can veer away from any irrelevant discussion and it can provide the details that your target audience would like to know from the very beginning of the undertaking. Do not just focus on your internal analysis findings. Your SWOT analysis chart must be balanced in a way that it can showcase both internal and external analysis results. The placement of all the information in the document must be organized so you can make sure that you can separate your strengths, weaknesses, opportunities, and threats description from one another. Create segments, headings, titles, and discussion formats that can give you a detailed overall presentation. Your SWOT analysis chart content must match the objective of the organization. You have to ensure that the details that you put together can really be used to identify root causes of problems and issues or can be used for planning development actions. 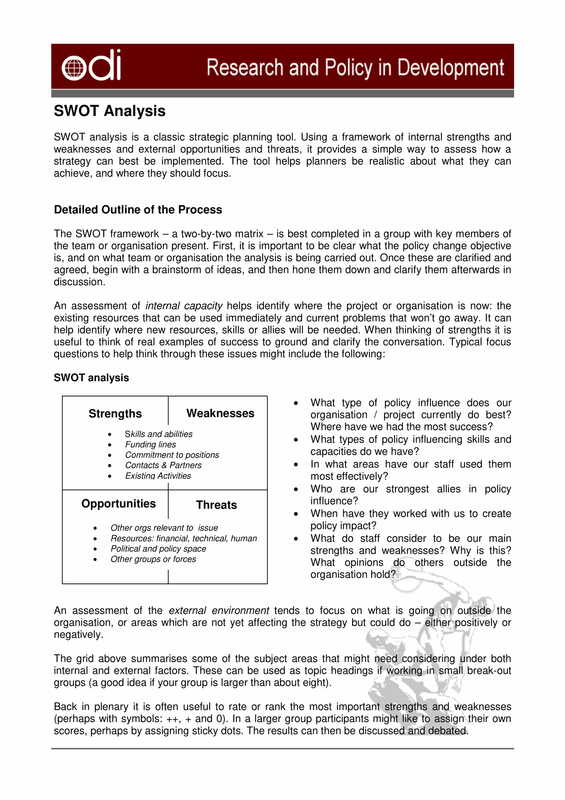 Having an idea of how you can use the SWOT analysis chart can make you more focused when directing your workforce or when implementing specific action plans. Ensure that all the items in the SWOT analysis chart are based on reality. All the information in your presentation must be measurable so that you can use them accordingly whenever necessary. Refer to credible resources or sources and make sure that details are firsthand so you can verify their authenticity. The completion of your SWOT analysis chart is very important to be considered and looked into as missing information can actually weaken the foundation of the document. You have to ensure that all areas of discussion needed by the organization can be covered by the document so you can make the most out of the SWOT analysis chart’s usage. Listed below are the elements that you need to look into if you want to create a simple yet structured, organized, and presentable SWOT analysis chart. The first quadrant of your SWOT analysis chart deals with the strengths of your organization. This includes the list of the qualities and characteristics of your company that allows you to stand out from your competition. More so, these characteristics help you to have a competitive advantage which can benefit your business in many more ways that one especially with regards visibility, profitability, and business sustainability. 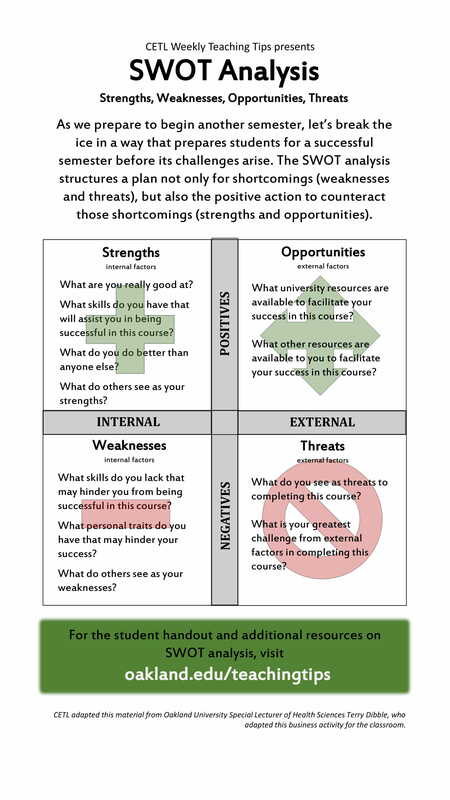 Another area of discussion that should be in your SWOT analysis chart is the description of your weaknesses. You need to identify the core of your gray areas so you can be aware on how you can improve on them. Listing down the weaknesses, disadvantages, shortcomings, and other areas of the business that is lacking can allow you to focus on these areas’ development. Being honest and realistic when listing your weaknesses can also help you become more eager to make plans of action for business management and operational improvement so you can achieve an overall corporate growth. List down all the opportunities that can be helpful in the development of the business or any of its particular areas. There are different environmental elements that can be considered as opportunities and not all of them must be taken. You have to be keen when explaining the reasons on why you believe that the organization can already resort with particular opportunities especially with regards the timeliness of the opportunities’ existence and relevance with the needs of the business. Aside from opportunities, your SWOT analysis chart must also deal with threats, which are considered as the external elements, that can negatively affect the organization and can hinder it from achieving milestones and getting to the condition that it aspires to be at in the future. Since there are different kinds of threats out there, you have to be particular when listing down the items that you think can provide the company with the most trouble. 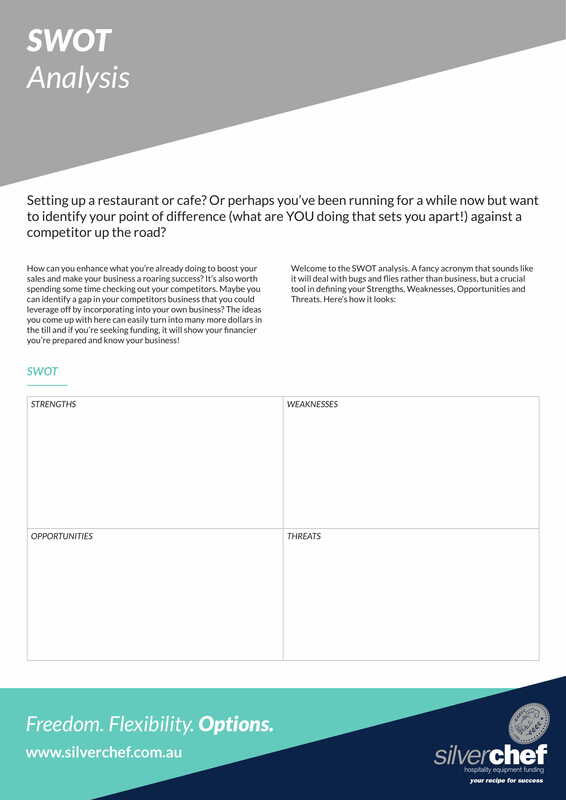 If you want to be more focused with knowing your competition and understanding the factors that contribute to their successes in the marketplace, we recommend the usage of a competitor SWOT analysis. 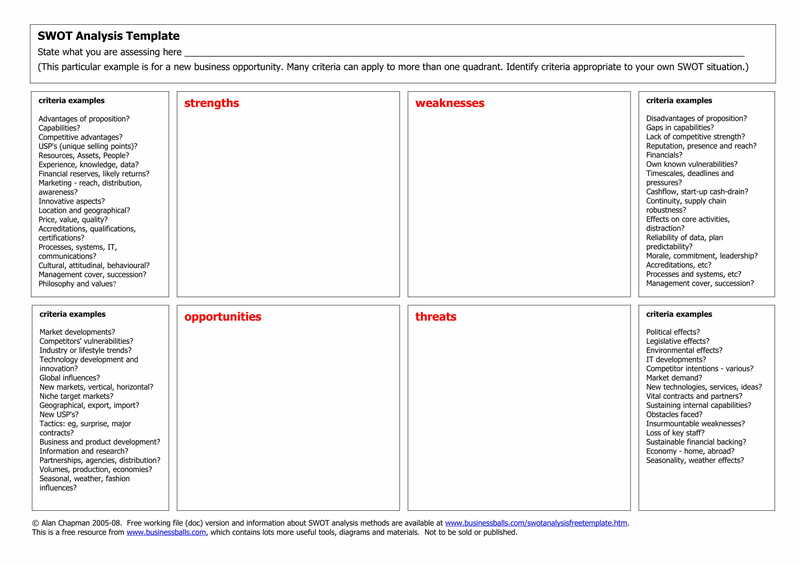 Ready to Create a SWOT Analysis Chart? Look into different kinds of professional SWOT analysis examples so you can identify ways on how you can properly create and present the chart that you will use. It will be helpful if you will make yourself aware of the basic guidelines about SWOT analysis development so you can ensure the efficiency of the chart that you will be making. Identify the purpose of the SWOT analysis chart so you can properly set limitations which in turn can enable you to focus on the main idea that you mean to present, deliver, and designate. It will be best if you can make a SWOT analysis chart that is as concise and as brief as possible so you can give highlight only to the most important areas of your discussion. 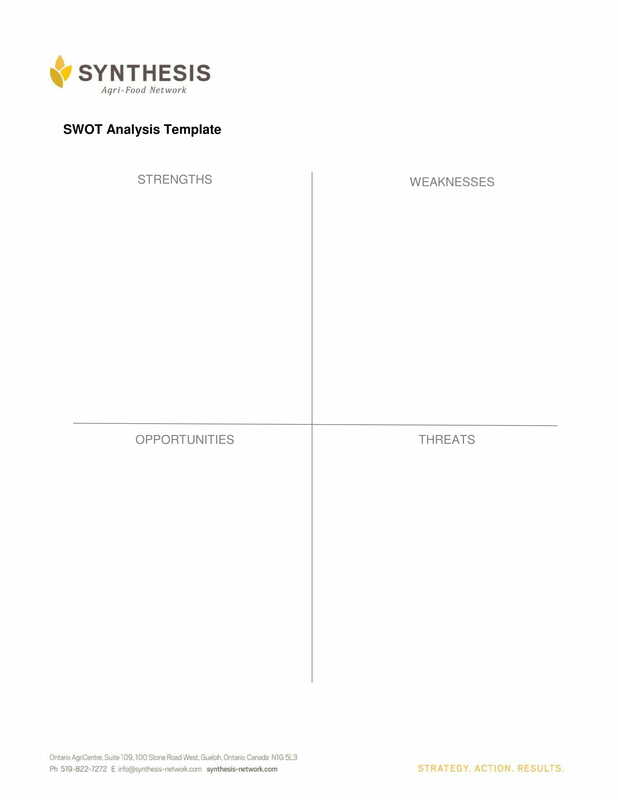 Know when to create and when to use a SWOT analysis chart. Find instances or circumstances where the document can be helpful or beneficial so you can make sure that no effort, resources, and time will be wasted. Being able to know the reason on why it is needed for you to create a SWOT analysis chart can give you direction with how you will make the overall content formulation and placement of the document’s details. Make sure that the final SWOT analysis chart is curated and put together properly. You have to ensure that there are no errors or mistakes in the document. Moreover, you have to look into the proper placements of all the information so that you can highly benefit from the segments that the chart promotes and showcases. You can get help from other team members so that there will be more reliable people who can browse through the document. This will enable you to make sure that there is little to no error within the document. 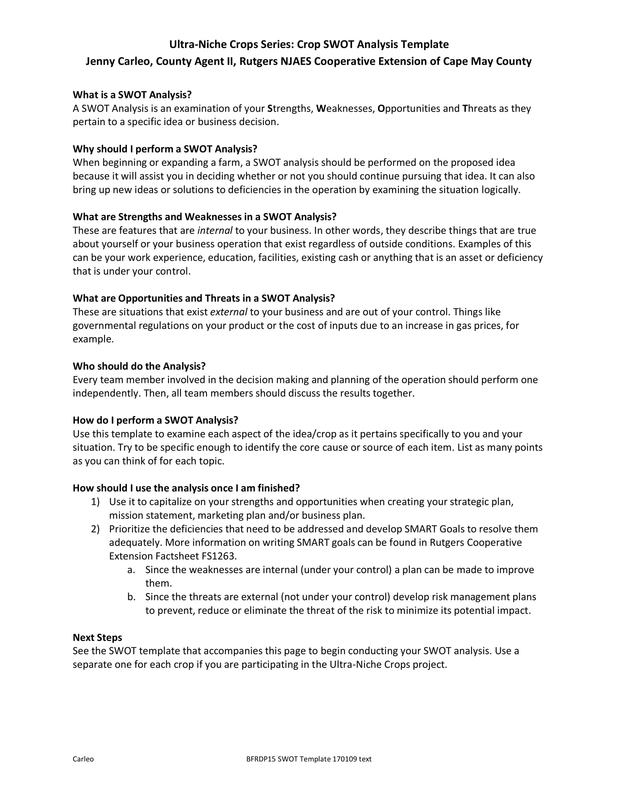 Ensure to download any or even all of the SWOT analysis chart examples that are listed in this post. Browse through all the examples that we have curated and select which of them are suitable to be used as references in relation to the kind of SWOT analysis that you would like to develop.